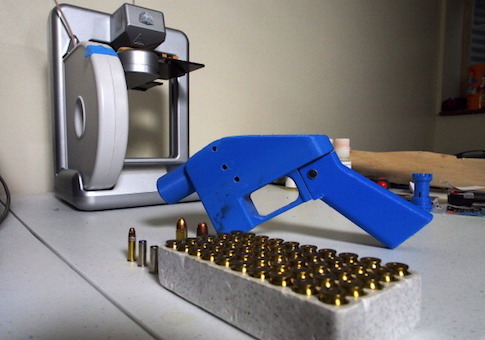 The Bureau of Alcohol, Tobacco, Firearms, and Explosives explained the laws that govern 3D-printed and other homemade firearms this week in an interview with the Washington Free Beacon. In the wake of the settlement between the State Department and 3D-printed gun pioneer Cody Wilson, which would have allowed Wilson to repost his gun designs on the internet, a great deal of confusion and misinformation has spread about the legalities of Americans making their own firearms. ATF special agent and public information officer Michael Knight said the ATF is aware of the development of 3D-printed gun parts and is always monitoring and evaluating new firearms technology. "ATF routinely collaborates with the firearms industry and law enforcement to monitor new technologies and current manufacturing trends that could potentially impact the safety of the public," Knight told the Free Beacon. "ATF's regulatory and enforcement functions are focused and clearly defined by laws and regulations governing the manufacturing of firearms. When ATF receives credible information regarding the illegal manufacture of firearms, it will investigate and take appropriate action. If individuals neglect to follow federal laws and regulations surrounding firearms, ATF will investigate their activities. ATF always tries to stay ahead of the illegal activity and novel firearms trafficking schemes while fully respecting the individual rights of citizens." Knight said it is legal for Americans to build their own firearms without a license so long as they are not prohibited by law from possessing firearms, the firearms are legal to own, for personal use, and not for sale or transfer to others. Whether the gun parts are printed, created by other ways of manufacturing, or legally purchased from a licensed dealer has no impact on whether it is legal for an American to build a gun for personal use, though some states like California have placed additional requirements on the process. Knight emphasized it is not legal for felons or somebody otherwise prohibited from possessing firearms to build their own guns under any circumstance. "Title 18 of the United States Code, section 922(g) prohibits several categories of persons (i.e., persons convicted of a crime punishable by imprisonment for more than a year) from possessing firearms in or affecting interstate commerce," Knight said. "Title 18 of the Unites States Code, section 922(d) prohibits persons from disposing of any firearm to a person the transferor has reason to believe is prohibited from possessing firearms under federal law." He reiterated that merely possessing a gun, no matter if they built it themselves or acquired it in some other way, would be illegal for a prohibited person. "It's possession," Knight said. "It's not manufacture. It's solely the possession of it." Knight said federal law already addresses another common area of contention surrounding 3D-printed guns: whether or not they are undetectable to metal detectors. He said the Undetectable Firearms Act of 1988 outlaws the manufacture or possession of firearms that can pass through a walk-through metal detector or X-ray machine commonly employed at airports without being detected. "A person or manufacturer cannot produce an undetectable firearm as prescribed in Title 18 of the United States Code, section 922(p)," he said. Knight also directed the Free Beacon to an online resource set up by the ATF that answers common questions about 3D-printed gun parts and how the agency monitors them. The site reiterates the agency’s commitment to applying federal firearms laws even to new technologies and monitoring any criminal attempt to bypass current regulations using the new technology. The agency emphasized, however, that federal law doesn't place limits on what techniques and methods may be used to produce legal firearms. "ATF enforces Federal firearms laws and, currently, these laws do not limit the technology or processes that may be used to produce firearms," one passage on the site reads. "However, ATF enforces existing statutes and investigates any cases in which technological advances allow individuals to avoid complying with these laws." This entry was posted in Issues and tagged ATF, Guns. Bookmark the permalink.